We’ve been travelling seven months now, and one thing we have learnt is that it’s tiring. I remember when we first left England and were in Beijing, we met someone who had been travelling for about six months. They were cutting their trip short because they were too tired. At the time I couldn’t quite believe what I was hearing, but now I appreciate it a bit more. The constant moving, the endless search for cheap but acceptable rooms, the long and uncomfortable bus journeys all add to it. Don’t get me wrong, I’m not looking for sympathy, and I wouldn’t change anything about our trip. It’s just been a learning experience. What’s made me talk about it this week was a moment Katy had as we walked to a beach called Corong-Corong. After breaking her beloved flip-flops and having to walk bare-foot across rocks, she exclaimed “Sam, I’ve had enough of beaches and being hot. I just want some home comforts, like air-con and a swimming pool.” I did point out to her that we have neither air-con nor a swimming pool at home, but it didn’t seem to help the situation. The Philippines has been a hard place to get around; probably the hardest out of all the countries we have visited. It’s something I didn’t really expect as I thought countries like Laos and Cambodia would be more difficult, but it was quite the opposite. Anyway, this is what I think led to Katy’s mini meltdown. To be fair it didn’t last for long, as after a long walk in the blistering heat we eventually got to the amazing beach that is Corong-Corong. We spent the afternoon relaxing in hammocks, swimming in the crystal clear sea and playing frisbee on the on the white sandy beaches. Then we watched the sun set whilst enjoying a few beers with fellow travellers. It was a great day that was finished with another Katy treat. We had pizza and white wine for dinner. This may not sound like much of a treat, but wine is something that we really can’t afford on our budget, and pizza is…well pizza. It was more like a shot of wine than a glass to be honest, but it was nice to have a change. We decided to change rooms as after having no electricity on the first night, we then had no water on the second night. So after a few hours walking around and checking prices, we settled for the Nido Bay Inn; slightly more expensive, but with hot water and WIFI. El Nido itself only has power between 14:00 and 06:00, which takes a bit of getting used to. It can make the morning quite hot in the room when there is no fan blowing. But it’s the price you pay for staying somewhere like this. After spending a couple of days doing very little, we booked two more dives. We were the only people on the boat other than the dive master and the captain, and we headed off to the island of Miniloc. It was a beautiful day, and we were really looking forward to our first fun dive, with no tests, skills or exercises to do. We didn’t even have to set up our equipment, so we just sat back and relaxed as we headed to the first dive site on South Miniloc. The first dive was almost like diving in an aquarium, with thousands of different types of fish everywhere. We saw enormous schools of yellow snapper and jack fish, some massive puffer fish along with countless others that we didn’t know. It was a great dive, and very different from our last dive in Malapascua with the sharks. We got back on the boat and had a break, with coffee and cake served by the captain. We talked about what we had seen and enjoyed the sun before heading to our next dive site, Twin Rocks. This was a very different dive from the first one, but one that made Katy very happy. We saw our first turtles here, and they were huge. We had been hoping to see some for a while now, and they are so nice to watch under the water. We also saw some sting rays and other fish, but the turtles were the main attraction. It was another great afternoon diving, which only makes us want to do it more. It’s very addictive, but sadly the one thing stopping us from doing it more is the cost. It’s very cheap to dive here in the Philippines (£18 per dive including all equipment and boat etc), but that can quickly eat into a budget. For the next few days we did very little other than a bit of exploring. We walked around the coast to see what beaches there were on offer. They were quite nice, and deserted, but not a touch on Corong-Corong. 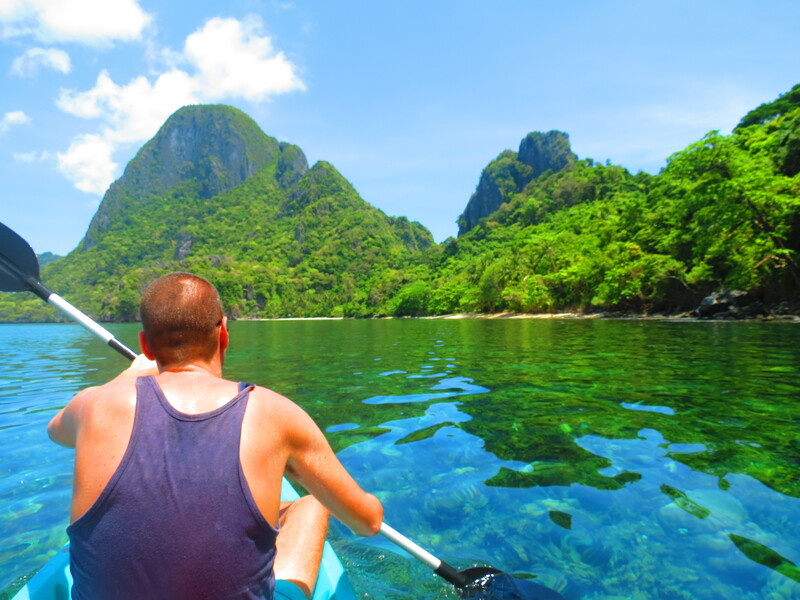 So we decided that we would explore some of the islands by kayak to see what we could find. The last time we went kayaking (in Vang Vieng, Laos), we spent the first ten minutes bickering about getting in rhythm and who should steer. It wasn’t any different this time either, but once we got going it was ok.
We didn’t really know where we should head to first, so we chose a beach that was just in sight on an island called Cadlao. We were quite relieved to get there as it was hot and tiring, and we cooled off in the sea to relieve our slowly fatiguing limbs. I even managed to find and open a fresh coconut for Katy to drink. Once we got some of our energy back, we continued on around the island, until we found a nicer beach. Again it was quite hard work getting around there with the currents (and Katy’s steering), but once we did it was worth it. It was a lovely beach that was totally deserted. We spent a few hours there, and literally didn’t see another soul. This is how I pictured the Philippines before we arrived here, and it was great. The area actually reminded me a bit of Ha Long Bay in Vietnam, with its limestone cliffs strutting out from the water. The big difference here is the beaches. Beaches like the one we found are common, and it’s easy to find your own private beach for the afternoon if you venture out by boat or kayak. 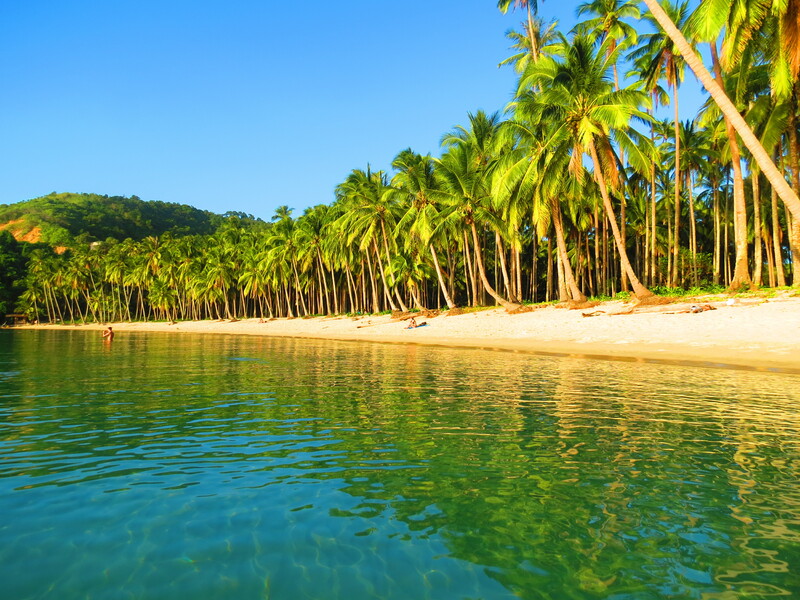 There are over 7000 islands in the Philippines, with over 1500 just off Palawan. For the last couple of days we have done very little, again. Tomorrow morning we leave on a rather epic journey to get to Bali. First we have a five-hour journey to Puerto Princesa and then after a couple of hours break we have a flight from Puerto Princesa to Manila. We have about four hours to amuse ourselves in Manila airport before another flight to Singapore that gets in at about 01:00. We then have six hours waiting at Singapore for our flight to Bali. It will be quite a testing day I’m guessing, but we should be used to them by now. The Philippines has been a combination of ups and downs. Very bad travel days combined with amazing diving, beaches and surroundings. Overall I think it is worth the effort because there is nowhere we’ve been so far that has had the wow factor that we’ve found here. Hopefully Indonesia will give it a good shot. Those of you that know me will know that I’m not normally a grumpy, moody person. Our start to the Philippines however wasn’t the best, and I found myself getting slightly disappointed…and grumpy. 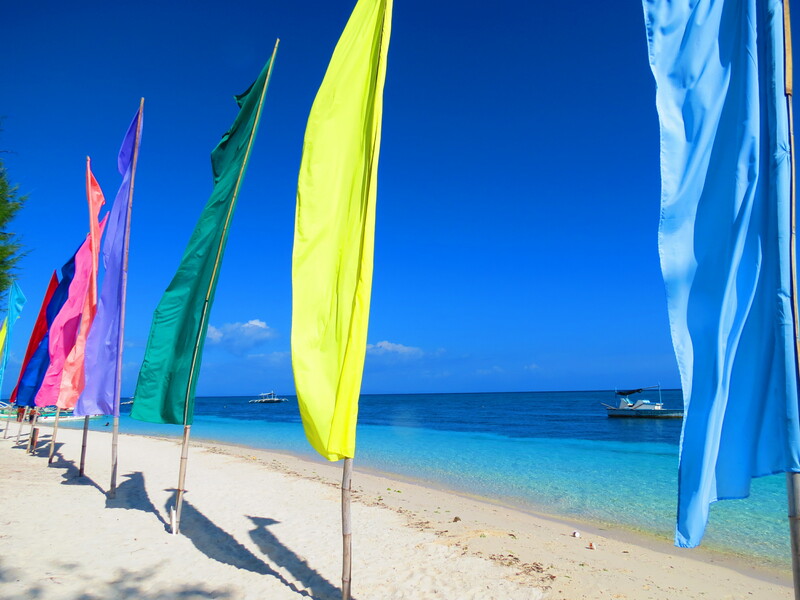 We had really been looking forward to the Philippines, with images of picture perfect beaches, crystal clear water and plenty of sun. This was quickly forgotten when we arrived in Cebu City to start planning the details of our visit. We knew where we wanted to go in the Philippines, and roughly the dates we wanted go there. This however was all thrown out of the window because of ‘Holy Week’ or Easter as we know it. All of the hostels, hotels and guesthouses we found were fully booked for Easter weekend. All of the flights to places we wanted to visit were booked out, and we were desperate not to have to spend the entire first week in Cebu City. We didn’t realise what a big thing Easter is here. Just to highlight how serious it is, that weekend over 50 people across the country were nailed to a cross. And I mean they were actually nailed to it. Anyway after hours of searching the web and calling around we eventually found a place to stay in Dalaguete, in the South of Cebu. The next day after a four-hour ride to Dalaguete, we arrived at our hotel to be told that they didn’t have our room available. Thankfully they offered to upgrade us to ‘the captain’s room. The room itself was good, with cable TV, air-con and a spa bath. We were a bit disappointed as there was no beach there, and very little to do in the area. But the weather was great, and we started to relax and enjoy ourselves. We had booked four nights, but ended up only staying there for two because we had found another place to stay in Dumaguete, one of the places we wanted to go initially. 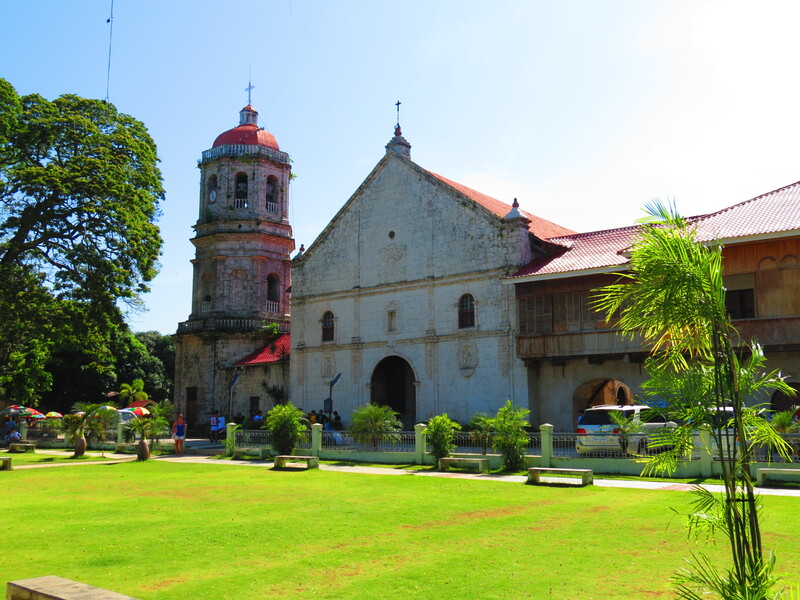 So after walking around the very small village on Good Friday, and a couple of nights chatting to other people in the bar, we made our way to Dumaguete on the island of Negros. Dumaguete is a nice little town, with loads of bars and restaurants along the seafront. There are quite a few day trips you can do here, but unfortunately as it was still Easter weekend, most of the tour shops were closed. 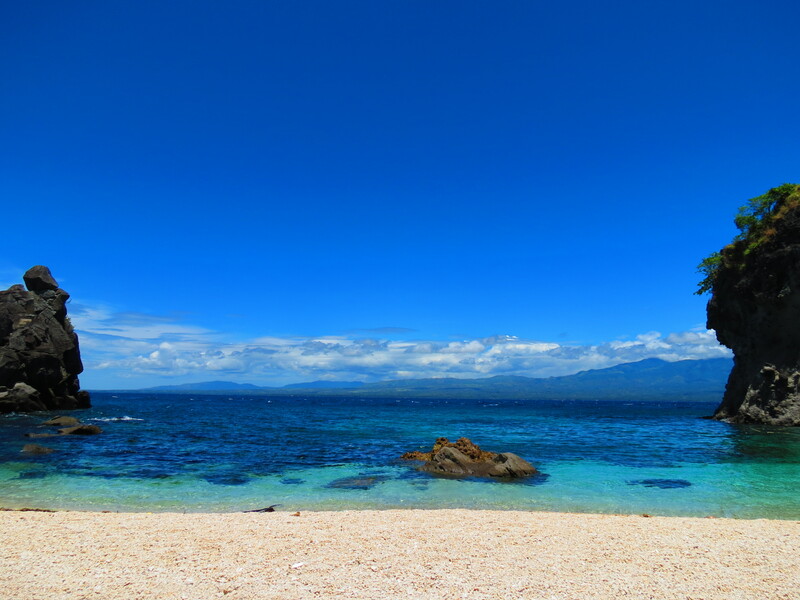 We did manage to make our own way to Apo Island for a lovely day on the beach. The boat over was expensive (about £30), and the sea was very choppy. It was only a small boat, and by the time we arrived there we were very wet and feeling a bit sea-sick. We were hoping to snorkel while we were there, but we decided against it because of the conditions. So instead we sat on the beach and enjoyed the sun. 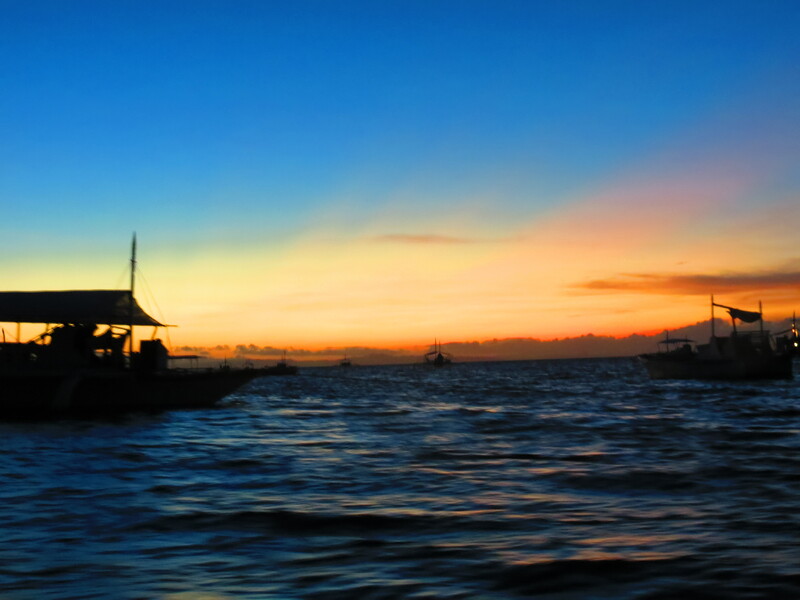 On our way back to Dumaguete, we had another rough boat journey back to port, followed by a trip in a jeepney. Jeepneys are basically pimped up, stretched jeeps usually with neon lights and big soundsystems, and we were squeezed in the back with 40 people, two chickens and some fish. It made for an interesting ride home. For the rest of our time in Dumaguete, we just enjoyed some nice food and a very relaxed atmosphere. I tried adobo, which is a local pork and chicken stew, and Katy tried Bangus which is a de-boned and fried milk fish. The next morning we had a very early start at 05:30. On our way to our next main stop Malapascua, we decided to make a quick stop in Oslob in the South of Cebu to swim with whale sharks. This is something I have wanted to do for years, and we weren’t disappointed. Our boat dropped us off, and as soon as we got in the water with our snorkelling gear, we were face-to-face with an 8m long whale shark. It was so close to us, it was a bit of a shock. 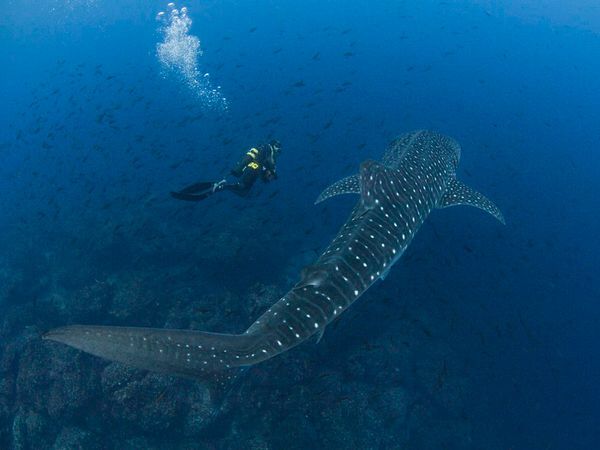 In total we saw four whale sharks, each of them coming within about a metre from us. One of them got so close that its tail brushed me as it glided past. We were holding onto some small boats and there was nothing we could do but hold our breath as it went past. It was an amazing experience, and one that we will never forget. As it took about nine hours to get to the north of Cebu, we had to stay on the mainland as we missed the last ferry. So we found a cheap place not far from the port to spend the night. The next morning we headed to Malapascua. It’s a great island with some lovely beaches, but the main draw here is the diving. We didn’t have any accommodation booked, so we spent some time walking around looking for something within our price range. As we walked through the village which is slightly inland, a woman came up to us in the street as asked if we were looking for somewhere to stay. I expected her to direct us to a guesthouse nearby, but instead she asked us if we wanted to stay in her house. It was actually a room attached to her house and very basic, but it was clean and dirt cheap (500 pesos or £7.50). We had decided to do our Advanced Open Water PADI course while we were there, so we had a walk around a few of the dive shops, and chose Sea Explorers. The course involves five adventure dives, which included a deep dive and a night dive. We were only there three nights, so it was a bit of a squeeze to fit it all in. So the next morning we had a 04:00 start for our first dive, a deep dive with thresher sharks. Once we had eventually woken up slightly and made our way to the boat, we had a stunning view of the sunrise as we made the 25 minute journey to the dive site. We began our dive, and it felt good to be in the water again. Then it got even better when a thresher shark swam towards us. We’d seen whale sharks already, but this is the first shark that looks like a proper shark. 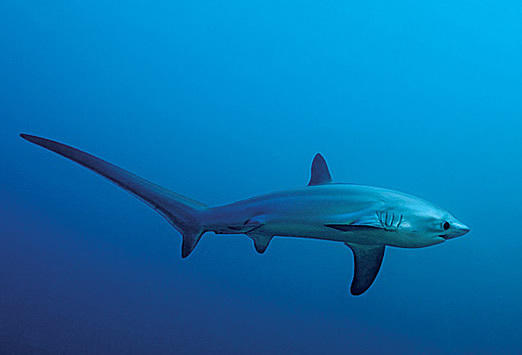 In total we saw four thresher sharks on the dive, but they were about 10m metres away. We also saw a devil ray and loads of other fish, but the sharks were definitely the main attraction. We got back to shore at about 07:30, and enjoyed a much-needed breakfast at a great restaurant we found called Isla Bonita. After a nap, we had the rest of the day free, so we went on a walk around the island in search of some deserted beaches. It was a really hot day, so it was good to stop off every now and then to have a swim in the sea to cool off. The people on the island are so friendly, and we found ourselves saying hello to almost everyone we walked past. It was nice to see some of the quieter parts of the island, and some of the villages away from all of the tourists. That evening we had a very quiet night as the next day we had three dives. Thankfully our first dive wasn’t until 09:00 so we had a bit of a lie in. Throughout the day we had a buoyancy dive, where we had to swim through a mini assault course underwater, then a navigation dive using an underwater compass and we ended the day with a night dive. We saw some great fish during the day including seahorses, hermit crabs, seagrass ghost pipefish, demon stingers and mandarin fish mating. Until I started diving, I didn’t realise how tiring it can be, and let’s just say after our three dives we were feeling it somewhat. So after another lovely meal at Isla Bonita (Beef Calderita and Barracuda), we wearily made our way to bed. The next morning we were up again at 04:00 for our final dive. It was a sunken island with a big drop-off. As we were swimming along the edge, a big 6m thresher shark came right up to us, within about 3 metres. Katy grabbed hold of me slightly panicked, but it was amazing to see them so close up. It even opened its mouth as it faced us, and then circled back around. We saw four different sharks again, but it seemed like more as they were constantly circling. It was a great way to finish our stay in Malapascua, and become qualified advanced divers. This will now allow us to do some of the better sites in Indonesia and the Galapagos (if we can afford them). After the boat back to the mainland, we then had a six-hour bus journey back to Cebu City. We’d booked somewhere that had internet and cable so we could catch up on some emails and watch the football. Unfortunately when we got there the internet was down, and they only had local TV channels showing what looked like their version of Home and Away. Yesterday after a short flight from Cebu to Puerto Princesa, we arrived in Palawan. 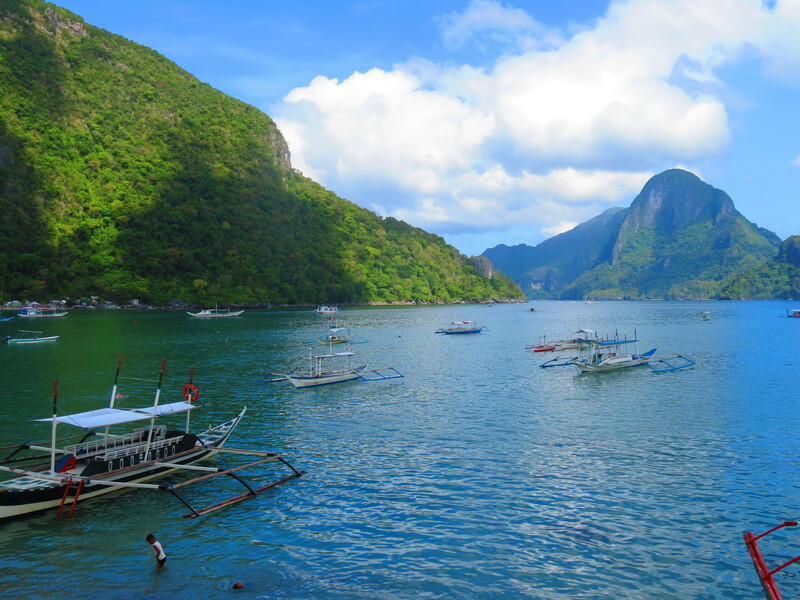 The plan was to get up to El Nido in the north of the island as soon as we could. After various negotiations with one of the tour companies, we managed to find a shared minivan to take us that day. It was a pretty hideous journey that took another six hours, but we were pleased that we hadn’t taken a normal bus. 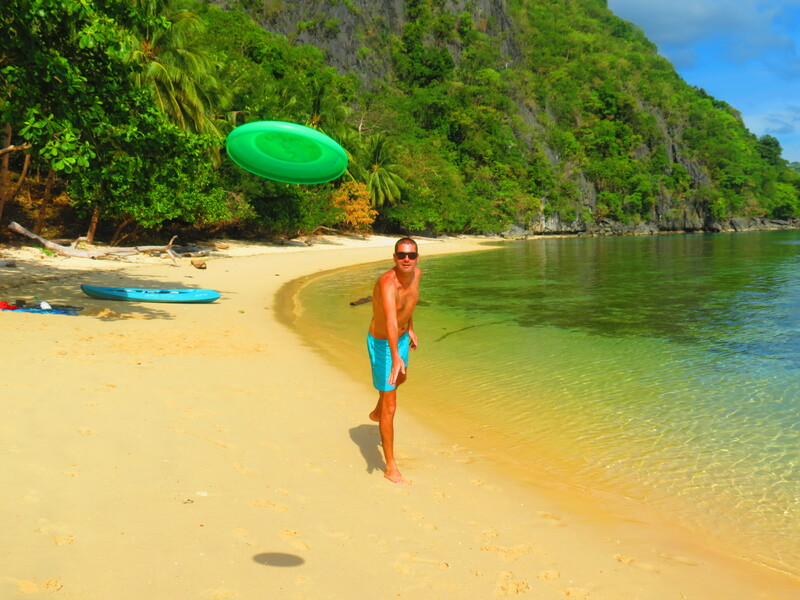 We arrived in El Nido when it was already dark, and managed to find a cheap guesthouse right on the beach. It had no power at the time, but we were just pleased to have finished our journey. We had a drink and some dinner before heading to bed. I woke up this morning to an amazing view out of our window, the sound of the sea and Katy snoring in my ear. 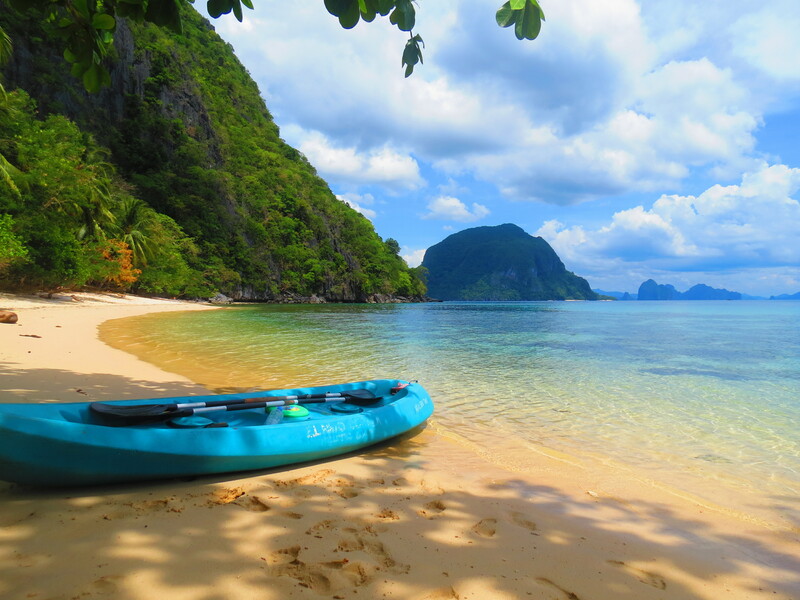 El Nido is a great place, and definitely worth the effort to get here. We’re not really sure what we’re going to do here yet, but today we’ve been looking around today for options. Our first priority is to relax and get some sun.